The Global Center for Journalism and Democracy presented information about World Press Freedom Day to students on the SHSU campus on May 2 and 3, 2013. Students from the GCJD Workshop class handed out free sunglasses with the tag “Don’t be in the dark about world press freedom” along with informational reports. You can also read those reports below. "The Good, Bad and Ugly of Press Freedom"
Journalists and journalism are accepted as a part of everyday life in the United States as teachers and mailmen. World Press Freedom Day on May 3 seeks to teach not only Americans, but citizens in other countries the importance of a free press. The day was started by the United Nations in 1993 as a reminder to people, journalists and governments that an independent media is a vital institution. FreedomHouse.org has compiled a Free Press Index since1989 that takes into account the economic, legal and social entities that make a journalist’s job easy or difficult in every country. The list divides countries into three categories: free, partly free and not free. “Free” countries account for 33.5 percent of all 197 countries in 2012. “Partly free” made up 36.5 percent, while those listed “not free” made up 30 percent of the world. Although a third of the countries are listed as free, only 14.5 percent of the world’s citizens have a mostly free press. 86.5 percent of the world’s citizens live in a country where their press is inhibited by the government and social pressures. Countries that received below a rank of 30 were designated as free. Finland, Norway and Sweden received the best press freedom rankings with a score of 10. In Finland, freedom of expression and access to information is granted under Article 12 of its constitution. It’s therefore become a staple of the Finnish government to be especially transparent. The country is also ranked as the world’s most free press by Reporters Without Borders. One reason for its continued success, after receiving top marks for the third consecutive year, is high media consumption. 468 out of 1000 Finnish people regularly buy a newspaper and 76 percent of citizens above the age of 10 regularly watch the news, according to the European Center for Journalism. Next in the Freedom House rankings, the Swedes have had a history of governmental support for transparency of public information and the freedom to report. They come in second to Finland because certain forms of hate speech can be criminalized. In 2010, some Swedish journalists were attacked for their political speech, including cartoonist Lars Vilks who drew the Muslim prophet Muhammad as a dog. He received several death threats and a few attempts on his life. However, these attacks have waned in the last year. Sweden ranks in the top newspaper reading countries in the globe with more than 75 percent of adults reading a newspaper everyday. They also have competitive local and national television stations; all of which have journalists who both report and actively self-censor on certain issues. The United States of America wasn’t far behind on Freedom House’s list getting a score of 18. Both Freedom House and Reporters Without Borders cite the 2011 Occupy movements as a blemish on free press in the country. Like other countries on this list, the United Kingdom (Great Britain, Scotland and Ireland) allows its media to act independently, including the government owned BBC. But there have been legal obstacles. Press freedom laws weren't in the original construction of the U.K. constitution. Instead, laws have been added over recent years to aid journalists including the Freedom of Information Act passed in 2000. In addition, several anti-terrorism laws force journalists to reveal sources, especially after the 2005 bombings. Recent corporate mishandlings at publications like News of the World harm media credibility and make it increasingly difficult for media outlets to gain trust from their viewers and readers. Unlike the other countries considered to have a free press, Australia's press freedom is seen through convention rather than legal provisions, according to Freedom House. As such, there are times when the government forces journalists to pay fines or publicly apologize for work that may need no apology. For example, conservative columnist Andrew Bolt published two articles in 2011 claiming a politician only claimed to be of Aboriginal descent for political reasons. He was ordered to publicly apologize. However, Australia owns a diverse group of media outlets from print to a formidable broadcasting network. In addition, 79 percent of the population has access to the internet. One troubling development, the Australian Communications and Media Authority is reportedly considering increasing the amount of censorship. France's governmental structure and constitution are friendly to a free press, but punishments for those who break the law are severe. Freedom of information laws exist as well as the defined right to a free press. The country has strict copyright protection and defamation laws in place to protect the rights of the victims and strict fines and punishments for those found guilty. However, in 2010 French policies went into effect giving more protection of journalists' sources. Now, a journalist must only reveal and give access to their source if it involves a serious crime. According to Freedom House, France has more than 100 privately owned newspapers, 1,200 privately owned radio stations and five public channels that are ad-free during prime-time television. Freedom House ranked North Korea the most repressive media country for both 2011 and 2012. "Under their penal code, listening to unauthorized foreign broadcasts and possessing dissident publications are considered 'crimes against the state' that carry serious punishments, including hard labor, prison sentences, and the death penalty." The North Korean media is owned and run by the state, so the only news that comes out is favorable to the country's leader. Foreign journalists have their phones confiscated and are forbidden to talk to the residents of the country. The government recently allowed the Associated Press to open a bureau in the country but under heavy restrictions. The protests that erupted during the Spring Awakening in Syria didn't go over as well as it did in countries like Egypt, Libya, and Tunisia. Protests are still going on today and with Bashar al-Assad's regime still in power, it is virtually impossible to get media access inside the country legally. It's a rough life for native and foreign journalists. The government began a systematic lockdown of the information superhighway. Some bloggers, online journalists and citizen journalists were tracked down and arrested. The only way many foreign journalists knew of the struggles Syrian citizens had were through these social media accounts. American journalist Marie Colvin and French photographer Remi Ochlik were killed by military rockets in the city of Homs on Feb. 22, 2012. They are two of many professional and citizen journalists killed in Syria. Although not necessarily as dangerous a country as Syria, Saudi Arabia is also hostile toward journalists. The country's Basic Law of 1992, the equivalent of their constitution, does not guarantee a free press. In addition, provisions of that law allow government officials broad powers to prevent any spread of information that may cause division or sedition. According to the government's media policy, a press should be used as a tool to educate the citizens, spread the ideals of the government, and promote a solid national front. In no way should it be independent. On its face it seems as though there are valid news sources with 13 independently owned newspapers circulating the nation. However, these are all owned by members of the royal family and rigidly follow the media policy set by the King. Like its neighbor North Korea, China has a history of repressing media coverage, especially reports that would cause dissent among the Chinese people. For example, during the Arab Spring uprisings in 2010 the Chinese government heavily restricted coverage of uprisings in other countries. Although the constitution allows freedom of publication and speech, those freedoms are subject to the discretion of the ruling party, the Chinese Communist Party. In addition, there are no laws on the books protecting journalists or their sources. The government maintains control of the nation's outward flow of information through the aptly named Central Propaganda Department. The government regularly arrests journalists and online activists with more than 90 arrested in 2011. Iran regularly imprisons, threatens and beats newspersons. The country has constitutional provisions allowing for an extremely limited press with no protections for the journalists. In addition, there are broad laws that prohibit most versions of dissenting opinion. President Mahmoud Ahmadinejad has shut down several news organizations for covering opposition forces and printing articles critical of him. Freedom House says, "Authorities said the paper had been shut down for 'publishing falsehoods and insulting public officials.'" Journalists and other citizens are often denied due process by being referred to the Islamic Revolutionary Court (IRC) when charged. In 2011, Iran had more journalists jailed than any other country. Of 179 imprisoned, 42 were in Iran. The Democratic Republic of the Congo has a constitution that guarantees the right to a free press, but its government routinely denies journalists that right. Journalists are also encumbered with "coupage" requests on a consistent basis. Coupage is where a journalist is basically bribed to be a PR agent rather than report the real news. Citizens and especially journalists are hauled away at gunpoint for criticizing the government and its policies. Journalists there are jailed, exiled, or killed on a regular basis. UN Secretary General Ban Ki-moon has issued a message on 3 May World Press Freedom Day, the UN office in Baku told APA. The message says that freedom of expression is a fundamental human right, enshrined in Article 19 of the Universal Declaration of Human Rights: “It is a cornerstone of good governance, sustainable development, and lasting peace and security." There are nearly 7,000 miles between Huntsville, Texas, a quiet Texas university town and Aleppo, Syria, a neighborhood on the frontlines of violent battles between the government regime and the rebels fighting to overthrow it. Every day, journalists in Huntsville diligently produce news stories with a wealth of information right at their fingertips. In Aleppo, journalists are also diligently working to produce news stories about what is going on in their communities. But there, they risk their lives to do it. 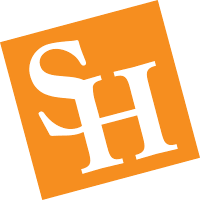 Connor Hyde, a journalist for the Houstonian Student Newspaper and a mass communications student at Sam Houston State University, understands the job of a journalist, but he, like many students, has no idea what it is like to be a journalist in a country where press freedom is extremely limited or non-existent. 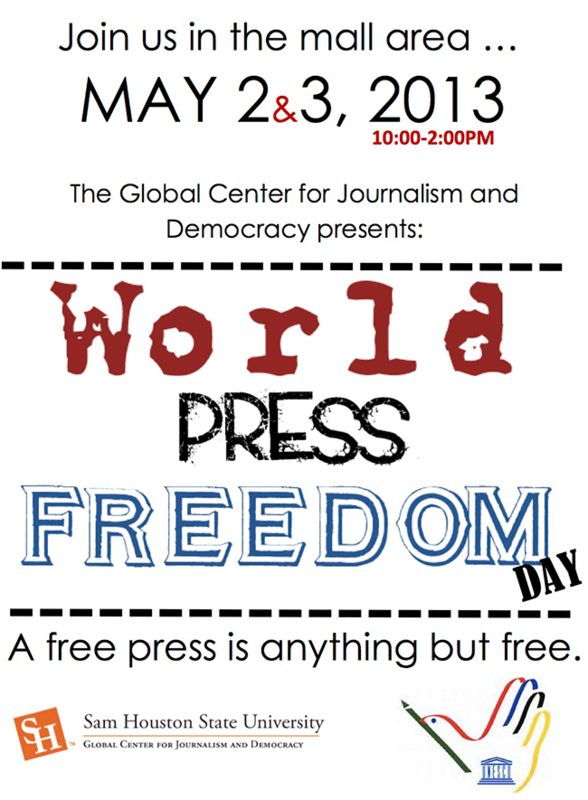 To get students across campus “out of the dark” about the realities of the freedom of speech and freedom of the press in countries like Syria, SHSU’s Global Center for Journalism and Democracy will host “World Press Freedom Day” on campus on May 2-3. The event, recognizing limited journalistic freedom globally and the importance of awareness, is part of a larger day recognized by the United Nations Educational, Scientific and Cultural Organization (UNESCO). The Global Center for Journalism and Democracy will have a table set up both days on campus to hand out free sunglasses with the tag “Don’t be in the dark about world press freedom” and informational reports written by mass communications students. They are also pushing information from their website and social media outlets. The reports include information on a missing Texas journalist, Austin Tice , a look at the most and least press friendly nations, an info-graphic about journalists who have been killed, kidnapped or abused and a comprehensive look at the laws, restrictions and actions that have recently been taken worldwide to restrict the press. Since the GCJD began last year, it has hosted several journalists, including Egyptian journalist and anchor for Nile TV Shahira Amin, and Irish Times foreign correspondent Mary Fitzgerald. Each of these journalists have emphasized the importance of what they do, including the core ideas behind having World Press Freedom Day. Kelli Arena, director of the center, said that the idea behind this event is to not only raise awareness about the sacrifices journalists are making overseas to report on what is going on, but also to get exposure for the new center, which she said is “devoted to a free press around the world.” Arena also hopes that this event will stick in students minds and help them appreciate the freedoms they have and sometimes take for granted. For more information about World Press Freedom Day, visit the Global Center for Journalism and Democracy’s homepage at www.shsu.edu/global-journalism or like their Facebook page. Additional resources about world press freedom may be found at Reporters without Borders, http://en.rsf.org/, The Committee to Protect Journalists, , and the UNESCO page at www.unesco.org. What happens when passion drives you to go somewhere dangerous? Would you go? Austin Tice chose to go. Tice, a freelance journalist from Houston , Texas was working on a law degree at Georgetown when he decided to put all of that away and pursue something more meaningful. His parents say Austin thought he had a better chance of being able to tough it out because he was a U.S. Marine veteran. He served tours in Iraq and Afghanistan. With his military expertise and the two years of law school under his belt, he decided to take some time off of school and pursue a passion that has been with him since high school. “Equipped with cameras, an exquisite writing talent and an instinct for finding his way to the center of things, he slipped over the Turkish border into Syria in May,” reporters from McClatchey said. Once he made it into Syria, Tice always seemed to find his way to the center of the action. Often times he would report things directly from the front lines. The tweets, posts, stories and videos kept coming until his birthday back in August. Suddenly, there was only silence. Then on September 26, a video was released showing Austin in a blindfold and bound like a criminal. What makes it worse is that nobody knows who has him. Since he was taken, many websites have been established asking for help. His parents are determined to keep his story in the headlines , hoping for more information. "We really have no idea who is holding our son, and that is our main purpose, to try to make contact with our son,” Debra Tice said. Unfortunately, Tice isn’t the only missing journalist in Syria. At the end of last year, the Committee to Protect Journalists reported there wer at least 15 detained or disappeared media workers in Syria. For more information or to find out how you can help his cause, check out: . To watch the video of Tice, check out http://www.youtube.com/watch?v=p9ROWeNCS8o.